Photographed in Oxford in the summer of 1960 is South Midland Ltd. FMO 937, a Bristol L6B of 1950 with a Windover ‘Huntingdon’ C33F body. Windover was a very old established firm that was known as a saddler and harness maker in Ottery St Mary from the year 1600. The family later became carriage builders, moving first to Grantham and then, in 1856, to Huntingdon where, by the 1920s, it became one of the largest employers in the town. Manufacturing premises held by other members of the Windover family in Manchester and Bradford were acquired in 1893. Production transferred in 1924 to Hendon until the firm sold out to the car dealers Henley in 1956. South Midland was a subsidiary of Thames Valley, with whom this coach first entered service as No. 555 in July 1950 before passing to South Midland some nine years later. It didn’t stay long at Witney, for, by October 1960, it was back with Thames Valley for a further year until withdrawal in October 1961. The following month it was sold to the Hampshire firm, Creamline of Borden, its subsequent fate being unrecorded. I had forgotten Windover had supplied Thames Valley/ South Midland with coaches on Bristol Chassis. Other outside coach bodies on Bristol L and LL I can think of at the time were Western ANd Southern National- Beadle and Duple. Hants & Dorset/ Wilts and Dorset Portsmouth Aviation and United Automobile Services Harrington; can anyone think of any more? Interesting post, Roger. Thank you. I think Borden relates to a chemical company and that you mean Bordon, in Longmoor Military Railway territory. Wandering, nay running, wildly off-topic, there is a roundabout at the junction of A27 and B3397 (Hamble Lane) which is officially Windhover Roundabout. Note the H. In this context it means a Kestrel. Does anyone know or have any ideas about the meaning in the coach builder’s context? Bartholomew WINDOVER was a bespoke saddler and harness maker working and living in the town with his wife Mary. From 1633 when Bartholomew was born to 1796 when Charles James Windover died, six generations of the family lived through some of the most exciting times in British history. I have a model of this vehicle in North Western Road Car Company livery. Should have added the fleet number, 270, and the registration DDB 270. Yes, Pete, it’s a typo. I mean Bordon – at one period in my varied transport career I regularly drove Aldershot & District Loline IIIs through there on the Aldershot – Petersfield – Steep route 6. One of the prominent figures in the Southampton based group of the Institute of Transport when I was a member in the 1960s and ’70s was Brigadier Nightingale of Longmoor Camp and its railway. I don’t think the reference to "South Midland Ltd (Witney)" is quite right. This was the organisation set up in the mid 1980’s when NBC split the Oxford-South Midland business into two parts. 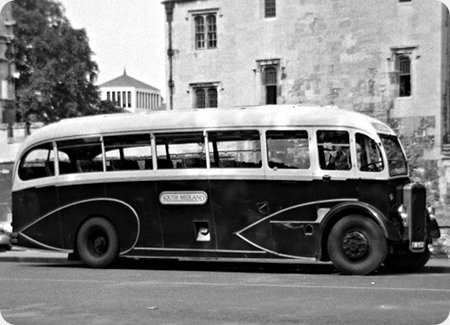 In 1960 FMO 973 would be owned by South Midland Motor Services Ltd. This company had been part of the Red & White group and in 1950, on nationalisation, passed to the control of Thames Valley along with Venture and Newbury & District. The head office became Thames Valley’s in Reading and South Midland ran out of depot premises in Oxford. Withdrawn by Creamline in 1963, presumably for scrap. For about three years, from 1961 to 1964, I lived in Southsea, but worked in Guildford. Every morning, the 07.06 slow electric train from Fratton would stop at Liss Station and on the other side of the platform would be anything from a WD Black 5 to a modest saddle tank loco pulling just two coaches with army/civilian staff who were changing trains for Bordon. What a comedown for such powerful locos as Black 5’s!